There is definitely a bias at Pontefract! And there is a meeting today. 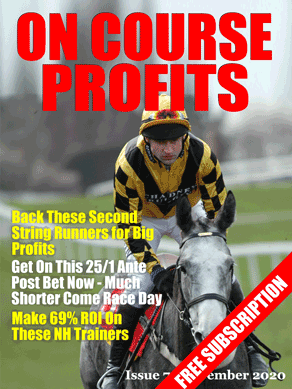 And if you want a horse racing education along with your winning tips then Mark's service is recommended. So here's the simplest system you will ever see. Back all horses in Stall 2 at Pontefract! Draw biases don't last forever and usually something changes and the bias is removed or everybody gets to know about it and the prices start to reflect the bias. So when one is discovered you have to make hay while the sun shines. So here are the numbers from Horse Race Base for the last 2 years for all races at Pontefract. If you look at stall 2 you can see that the strike rate is 25% and the return on investment is over 70%. Ideally you will use this information to inform your selections at Pontefract but you could just back all stall 2 runners blindly until the bias fades. We gave a nice 20/1 winner yesterday hopefully you had a few quid on it? There are a lot of people who don't think it's possible to pick big priced winners but it is certainly possible and some people can do it on a regular basis. Yesterdays winner was actually given by at least two services. We featured it courtesy of Carl Nicholson's Value Backing service. Carl is a regular tipper of big priced selections with his biggest being Solemnia that was given here at 50/1. If you had a bet on Azrael yesterday then I would urge you to invest some of your winnings on a subscription to Carl's Value Backing service. Matt Bisogno's Winning Trainers 2.0 is going live today at 12:00. If you've not been following along with Matt's launch this is probably the last chance to get the free systems that have been given away. If you get over to www.winningtrainers.co.uk before 12:00 and add your email address you should be able to pick up the 10 trainer systems and the hot jockeys system. After 12:00 you can sign up for the Winning Trainers 2.0 service. If you sign up you will get the Winning Trainers 2.0 manual which outlines the rules for the 10 trainers that make up the system. You will also get access to a members area where the Winning Trainers 2.0 selections are posted each day. The bonus that caught my eye is the Stable Tours. Matt will be visiting each of the trainers featured in the Winning Trainers manual and talking to them about their horses and their plans for the season, to see if he can glean any additional profitable info. His findings will be shared with members. There's a lot of buzz around this and it looks like it will sell out quickly, so if you want to get involved don't dilly dally. If you volunteered to test the Bonus Bagging system thank you for putting yourself forward. We've now selected our tester so unfortunately, if you haven't heard back from us then you havent been chosen this time. We were very pleased with the response and so will be actively looking for other products that our readers could review. I've just been playing around in HorseRaceBase and was looking at the record of Nicky Henderson. That's a 4.5% loss on investment! That strikes me as pretty amazing, I reckon that with early prices you could break even just betting blindly. That's a great start for finding a winning system. There are some interesting numbers here, the most interesting being that stable jockey Barry Geraghty is showing a level stakes profit over his 980 rides. For now I'm going to finish off with a quick look at Barry's record especially since 2008 when he took over as stable jockey from Mick Fitzgerald. As expected there weren't many runs before 2008 (just 10) although they accounted for 6.25 points of the 15.79 profit. Although there are good profits from some of the jocks listed above I think any system that includes a jockey aspect will come from drilling down into Barry's rides. Barry rides about a third of all the Henderson runners and will obviously be first choice for the best horses unless owner demands are otherwise eg Waley-Cohen. Next I will look at race types and class, I'll report back tomorrow.